Emanuela, Christina & Rita, I honestly do not know where to begin to thank you for everything you have done for us over the past 18 months and for helping us to achieve the wedding of our dreams which would not have been possible without all of your help. From the moment we met you, you have all been amazing and so friendly. Both Eoin and I have said how we will miss our trips to Sorrento and meeting with you. 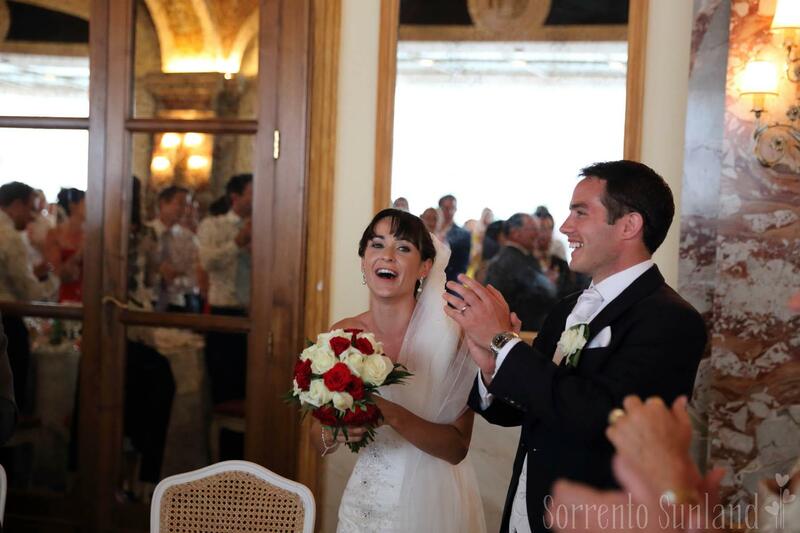 If you are reading this and planning on getting married in Sorrento (or surrounding areas) then please do not look any further than these three ladies at Sunland Sorrento as we could not speak more highly of them. These ladies helped us organise the greatest day of our lives and we would highly recommend them to anyone in the world. The service they provided was worth 10 times the cost. We both had a very clear picture of what we wanted our wedding to be like, and as it was a little different to the traditional Italian wedding, we came across some obstacles along the way, but there was not one obstacle for which you were not able to find a solution to. You took so much of your time driving us around to all of the venues we wanted to view and you could not have done more to help us find the perfect venue and church. The service we received from you at all stages during the planning of our wedding was just incredible, and we did not think it could get any better until the actual day of our wedding. From the moment we woke up, everything just flowed perfectly and everything was so well organised. We did not have to think or worry about anything, everything just happened like clockwork. My veil had been steamed and delivered to my room the night before, the photographer, hair and make-up artist all arrived at my hotel room right on time. We transferred our guests from Sorrento to Positano by boat - the boat, food delivery and drink deliver for the boat all arrived on time. All of our 125 guests were directed onto the boat and accounted for. When the wedding cars arrived, the call was put through to my room and Rita was waiting there to co-ordinate everything. Christian and Emanuela went to the church early that morning and laid out the bass booklets for us and directed our guests into the church when they arrived. Everything on the day was just perfect – the transport, the church, the flowers, the cake, the music and the reception – all just exactly how we imagined it. These ladies had everything planned to perfection and this was so evident from first thing the morning of our wedding that we were able to sit back, relax and enjoy the entire day knowing that they had everything in hand. All of our 125 guests from Ireland and UK were extremely impressed with everything and thought the setting and location was just beautiful. The majority of people have said that it was the best wedding they have ever been to and we would just like to thank you for making this possible. From our very first meeting to the very end, you have all been so helpful, friendly and professional. Thank you so much for all the hard work and effort you put in to our wedding and for making it a day that we (and our guests) will never forget. We hope to see you the next time we are in Sorrento. Thanks Again.